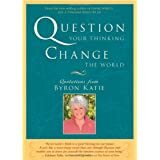 Question Your Thinking, Change The World: Quotations from Byron Katie ReviewThis may be one of the most profound books I've read. If Katie's approach to life resonates with you ("The Work"), this book will have a special place on your bookshelf. This book isn't about "information". If you need "information", look elsewhere. This isn't snackfood. It's not about a quick-fix to problems in your life. (Go see your psychologist.) It's about seeing life in a whole new life-altering perspective. The book takes you through Katie's laser-focused process of systematically destroying everything you thought you knew about life and simplifying it down to it's beautiful core. The book works its way around a number of topics, but the theme always comes back to "The Work", a simple set of questions that allows you to really see what is going on around you. It's about how to wade through life without the weight that is currently on your shoulders. She takes you through an amazing journey that will show you that even in the worst of circumstances that the only villain is your own thoughts. I've read all of Katie's work. I've met Katie in person. I love that this stuff isn't "pie-in-the-sky" pink-crystals-and-new-age-music stuff. It's real. It's very specific. It has changed real people's lives. And if you let it flood your mind, it will change you forever in a positive way. Want to learn more information about Question Your Thinking, Change The World: Quotations from Byron Katie?